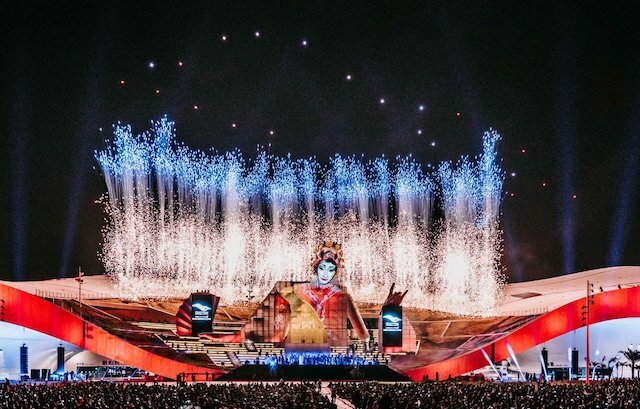 The opening ceremony for the world's largest covered arts center was advertised in Kaohsiung as the "party of the year that you can’t miss.” Over 5,000 people took this message to heart and showed up to see a combination of traditional dances and music, interactive light painting, drum performances, a puppet theatre and our drone light show as part of the finale. 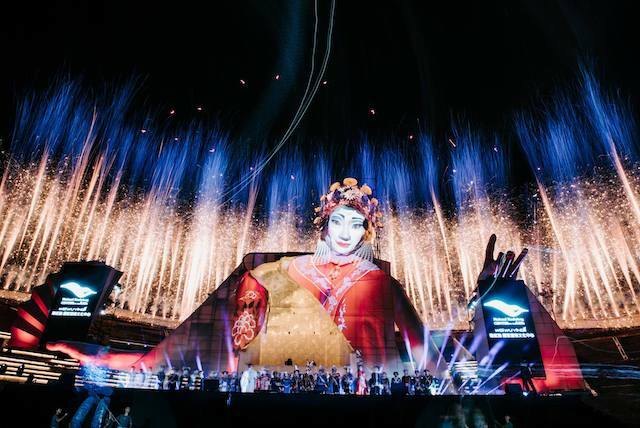 The ceremony was produced by phase7 performing arts from Germany, who have collaborated with us for many years in several international grand outdoor events to incorporate stunning drone shows into their always innovative and technology-intensive art performances. The highlight of our Taiwan show was a fully three-dimensional animated dragon – designed by Ágnes Előd, sculptor from Hungary – that flew gracefully over the building laced in golden colors. This formation was a great example of why we believe that our drone light shows are a new form of artistic expression with widespread possibilities. We always try and make each of our drone light shows unique by pushing the boundaries in the number of 3D dynamic animations and light effects we deliver. Thanks to our proprietary drone show planning software, Skybrush, we can combine high-level coding and artistic skills to design, visualize and configure shows for our customers in close to real-time. Our Taiwan drone show also posed an interesting challenge: the massive size of the building we flew over made it difficult to create the illusion of lively motion. Our solution was to include animations in which the speed of the drones was pushed to their safe limits while keeping in line with the size of the event. The resulting images resonated well with the stunning design and light effects of the stage and with the interesting music, combining local traditional and modern electronic genres. Because we oversaw our drone fleet from the backstage area, we accidentally treated a few hundred people to a second, standalone spectacle when they gathered around to watch us work ‘behind the scenes’. It felt satisfying to hear their appreciative applause after our drones landed precisely in the same spot from which they took off. We had a great time in Taiwan and are very grateful to the people of Weiwuying and to phase7 for this great multi-national collaboration.